When I were a youngin', oh so many years ago, there was no such thing as a Game Boy, and we had to make do with those Game & Watch devices. Everybody remembers the famous Nintendo Game & Watch titles, Mario's Cement Factory, Zelda and Donkey Kong. They were design classics. They have a tendency to pop up on websites from time to time, vigorously stimulating our nostalgia teats. What we don't get to see, though, is that for every Game & Watch Nintendo made, there are literally hundreds of games from other manufactures, both ahem...inspired by the Nintendo games, or interesting original works. 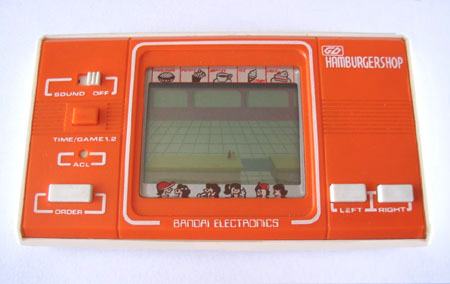 Many people will cite a Nintendo Game & Watch as their first ever portable experience. I can't say the same. I remember pressing my face against the glass display cabinets in Woolworth's, ogling the vast array of small colored bits of squeaking plastic contained within. Honestly, to me at the time they all looked the same with their screens turned off. Just slightly different shapes and colors. Now, I wasn't to be trusted yet with small pieces of technology, so it fell to my older brother, who would have been aged 8 or 9 at the time, to hand over the cash money and liberate one of those games from inside their glass prison. He chose carefully, and wisely. He chose...Hamburger Shop. It's a game where people order burgers and other foody things, your task being to remember what each customer had ordered, then to grab it and serve it up. Exciting stuff, I can tell ya. I didn't have a clue what was going on in the game, no matter how many times my brother tried to explain it to me. I was just happy watching stuff move around the screen making bleeping sounds. I haven't changed much since then. There are online museums dedicated to these machines from makers such as Bandai, Casio, Epoch, Tomy and Gakken. There are so many of them that collecting them can become a very expensive and time-consuming hobby...omething I'll be leaving to the experts. During the late 80s, when I visited a school friend once, I encountered something that I'd never seen before. 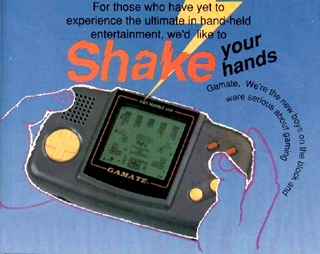 A small, handheld game machine, with interchangeable games? How come I didn't know about this? The machine in question was the Microvision from Milton Bradley, fine purveyors of board games and such. In the 70s, everything was being electronicized (which is a real word, I swear! ), so traditional games manufacturers like MB and Mattel invested heavily in getting some flashy bleeping plastic onto the shelves. The Microvision was a tall, narrow device with a 16x16 pixel dot matrix display. So in effect, a really primitive version of a Game Boy. You changed games by changing the entire fascia of the unit, so that each game could have totally different button layouts. There was only a handful of games released for the machine, with a Breakout/Arkanoid style game called Block Buster being the pack-in title. Other games included puzzle games like Mindbuster and Connect Four, and action games like Sea Duel and Alien Raiders. Simple stuff but I'm sure the kids went nuts for 'em back in the day. Why were these units so rare though? Why hadn't I heard of them? The reason for that is simply that most of the machines died! They weren't put together all that well and many of them succumbed to damage by static electricity. Imagine a kid wearing shuffling around on his parents newly installed nylon carpet. Bored with Block Buster, he/she changes cartridges, unknowingly delivering a deadly jolt of electricity directly to the chips on board. Many of the units that survived this untimely death have since seen their screens decay, fading so much as to make seeing the pixels impossible. Working machines do pop up for sale quite often. I think I'd be way too scared of breaking one to actually go ahead and buy. Perhaps one for your geeky display cabinet, but not something you can realistically take out and play every day. Not that anyone would, with it being about the size of two original Game Boys stacked on top of each other! 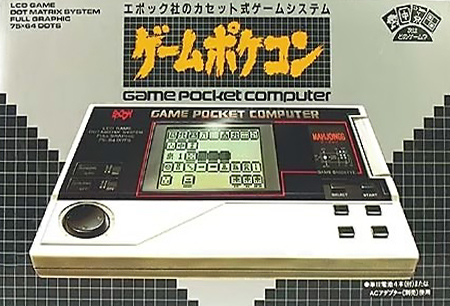 A piece of hardware that up until very recently I'd not even heard of is the Game Pocket Computer by Epoch. I can pretty much guarantee this is the first time you'll have seen it too. What is it? It's pretty much the Game Boy, only not made by Nintendo, and coming a whopping five years before the Game Boy launched. So how come we're not all wandering around playing the Epoch Pocket Advance GT or something? Maybe it's something to do with it not exactly being "pocket" sized. That and a combination of not so amazing games. Yay Reversi, Ooh Mahjonng! Surely not a Pac Man ripoff? Arguably a decent enough selection but probably not what the kids were looking for. That, combined with a high asking price for the time meant it just didn't have the desired impact. Nintendo's games were where the fun was being had at the time, nothing else really got a look in. Machines like this wouldn't be taken seriously until they had the games to go with them. Due to its scarcity, the Epoch Game Pocket Computer has become a highly sought after piece of gaming history, with mint condition units exchanging hands for hundreds of dollars. While I'd certainly love to get my hands on one, unfortunately I have bills to pay and food to buy! In 1989 Nintendo launched the Game Boy, you might have heard of it. It had some good games and a fair few people bought one. (Okay, it was awesome and everybody bought one.) A couple of other companies, Sega and Atari also released machines, only more powerful and... nowhere near as successful. The Game Boy was the success that it was due to price. It was cheap to buy and cheap to run. How can you try to beat that? I'll tell you how. By being even cheaper. Both of these machines were attempts to cash in on the Game Boy craze in the early 90's. Technically, they weren't all that far off from the Game Boy, the problem was naturally that you couldn't get Mario or Tetris for them (unless you count the dodgy "falling block" games). You couldn't swap games with your friends at school. You were the odd one out. 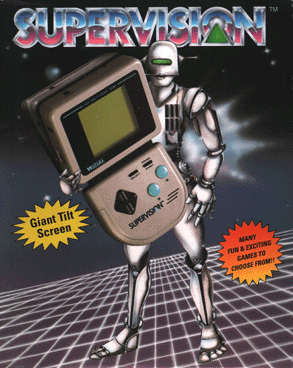 At least if you had a Game Gear or Lynx you could parade around going "Look at my Coooloooor!" until your batteries ran out. These Boy clones had no appeal whatsoever, only lingering on the shelves for a few, game-dry years. There are people who collect these but they must be compulsive collectors -- in the crazy old man hoarding magazines and newspapers kind of way. They ain't worth it! They never were! I'm sure there are portable gaming devices hidden in history that still lie undocumented by the vastness that is the Internet. It's up to these games hoarders to find them and place them in their virtual museums, so we can all go "aaaaah I remember that, I thought it was crap!" or maybe something, a little more positive. Wish the eBay squadrons luck now! Our history depends on it!